This constant voltage and constant current programmable control power supply module makes analog integration and digital control functions combined in one. This module has power-down stored function that it can store 10 groups of preset values and extract 2 groups of stored values. 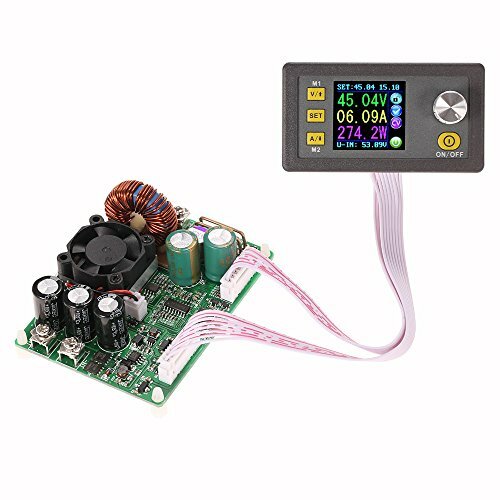 With LCD display, user can view the preset voltage/current, output voltage/current, output power, input voltage, etc. This product, with small size, advanced functions, good visual effect, high operability and high precision, can not only be used independently, but also inset into the device for wide application range. 1. It is better to make the input voltage lower than the Max. value, otherwise the item maybe be damaged. 2. Please ensure that the input voltage is higher than output voltage above 1.1 times. Notice heat dissipation under high current operation. 3. Please connect the connecting wire(between display module and power module) correctly, or it can not work normally. Set default boot open or close the output. Adjustable output voltage range from 0V-50.00V, adjustable output current range from 0-15.00A. The module can storage 10 groups of preset values and it can quickly extract 2 groups of preset values. LCD display and voltage/current meter function, you can view the preset voltage/current, input voltage, output voltage/current, output power, etc. In the output state display area, it is convenient for you to know whether the output works, constant voltage/current output state, current data group extracted, etc.